When Amazon kicked off a bidding war for its second North American headquarters in September, the company laid out a vision of its perfect suitor. The ideal city would have more than a million people, mass transit, an international airport, attractive housing, and “stable and business-friendly” regulations. But the retail goliath apparently isn’t worried about how surging seas, extreme weather, and deadly heat waves might affect its operations or the 50,000 employees it promises to hire in its new $5 billion “second home.” The company also doesn’t seem overly concerned with how much its ravenous appetite for energy and reliance on fleets of fossil-fueled delivery trucks are making those things worse. Amazon made no mention of climate change in its HQ2 request for proposals. Few, if any, of the public bids from 238 cities in 54 states, provinces, and territories throughout the United States, Canada, and Mexico included risks from warming temperatures. Likewise, Amazon refuses to release data on its greenhouse-gas emissions, making the Seattle-based giant a pariah among environmentalists who rank it as one of the least transparent corporations of its size. This year, unseasonable wildfires, 1,000-year floods, and back-to-back scale-topping hurricanes made climate change more tangible for many Americans. Yet the nearly $566 billion corporate titan has managed to erect a tent around its circus over a second headquarters to try to keep out the frightening weather. And all the players seem willing to ignore the forecast. The company plans to announce its decision next year. In the meantime, analysts made their own rankings. Moody’s Analytics considered 34 variables, including costs, quality of life, and transportation. 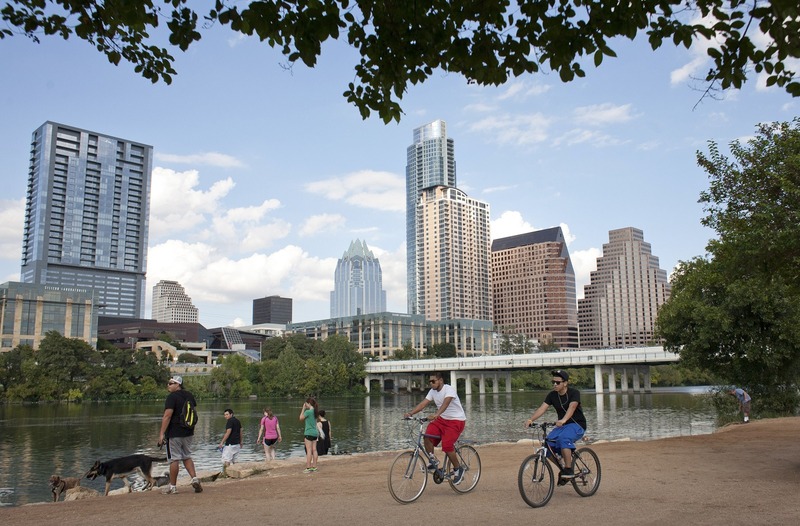 The analysis, published in October, ranked Austin, Texas, a city racked in recent years by drought and flooding, first. Atlanta, prone to heat waves, was second. Philadelphia, a coastal city at risk of sea-level rise, came in third. Another analysis by Anderson Economic Group yielded different results but still ignored climate change. CNN and The New York Timesmade their own lists but mentioned “climate” only in reference to business regulations. Including climate data in economic and market forecasts remains a surprisingly novel concept. Noticing the research void, Aseem Prakash, director of the University of Washington’s Center for Environmental Politics, formulated his own ranking based on climate vulnerability. He and his fellow researcher, Nives Dolšak, calculated the total number of days each county spent under a federally declared emergency or disaster. They based the assessment on 25 years of Federal Emergency Management Agency data on severe storms, flooding, hurricanes, tornadoes, snow, coastal floods, and weather-related fires. They used 1992 as the start date to include Hurricane Andrew, the second-most damaging storm in the U.S. after the 1926 Great Miami storm. Only two cities―Portland, Oregon, and Pittsburgh―ranked in the top 10 for both the Moody’s study and theirs. “This suggests that economic and business criteria probably do not help us to understand a city’s vulnerability to climate change,” Prakash wrote in a blog post. Including climate data in economic and market forecasts remains a surprisingly novel concept. It’s only been in the past two to three years that insurance companies―whose business is based on predicting and planning for potential risks―began seriously reconsidering how it plans for a warmer future. The British Labour Party announced plans to include climate change in its economic predictions just last month. And most big tech companies, such as Facebook, Apple, and Alphabet’s Google, release detailed reports on their energy use and overall output of carbon pollution. But not Amazon. The company touts its efforts to reduce its emissions of planet-warming gases, trumpeting the solar panels on its warehouse roofs and encouraging customers to recycle its packaging. In October, CEO Jeff Bezos tweeted a video of himself christening the company’s 18th renewable-energy project and largest wind farm yet―a roughly 100-turbine operation in Snyder, Texas―with a bottle of champagne. But Amazon scored an F for energy transparency, a D for renewable commitment policies, and a C for energy efficiency on Greenpeace’s 2017 Clicking Green report. The annual report uses submissions by the company to Greenpeace, investor reports, investment announcements, and media stories. While Amazon may be best known for its e-commerce store, the lion’s share of its profit comes from its Amazon Web Services arm, which controls about 42 percent of the global cloud-computer infrastructure that powers the internet. The division generated $4.58 billion in revenue in the third quarter of this year, Amazon reported in October. The company’s e-commerce branch operates on thin margins, but AWS rakes in profit. The division earned $1.17 billion in income, compared with just $347 million from the rest of the company for the quarter. The data centers host a huge swath of the internet―including Netflix, Yahoo, and the Huffington Post―and require enormous amounts of electricity. One data center uses as much electricity as 25,000 homes. The world’s data centers already constitute about 3 percent of global greenhouse-gas emissions, and the sector’s energy consumption is set to triple in the next decade. Amazon could leapfrog its rivals by making climate change and renewable energy a key focus of its hunt for a second headquarters, Cook said. “For them to signal that this is important to them would really drive a much broader conversation among cities who are saying, ‘Hey, we want Amazon and companies like them. We need to help them achieve their goals and deliver infrastructure, electricity, and transportation options to advance their goals,’” he said. Amazon operates with a monopolistic power, leveraging its dominance in e-commerce and cloud-computer to become a powerful player in other markets, such as television production, publishing and fashion. The ethics of that power concentration aside, the company has a responsibility to use its market dominance to force systemic changes in its industry, Prakash said. If the company began pressuring UPS, FedEx, and other delivery services to convert their truck fleets to electric vehicles, it could dramatically decrease the carbon pollution of each package sent from an Amazon warehouse.